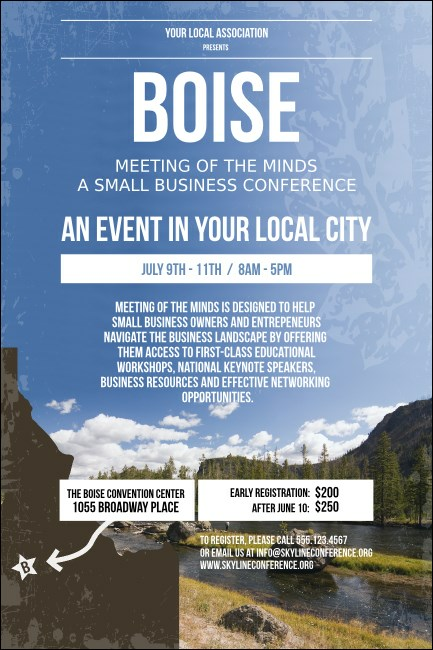 Promote your next event in the City of Trees with the Boise Poster. Features a peaceful view of the picturesque Boise River Valley, with an overlay of Idaho in the bottom right corner. From the State Capitol to Bronco Stadium, raise awareness of your concert, fundraiser, or conference with the Boise Poster. Plan your next Boise event with the help of TicketPrinting.com.